Come visit the adorable animals and adopt pets at the Seattle Center monorail platform on Thursday, August 11th, 2016 from 3-6pm. 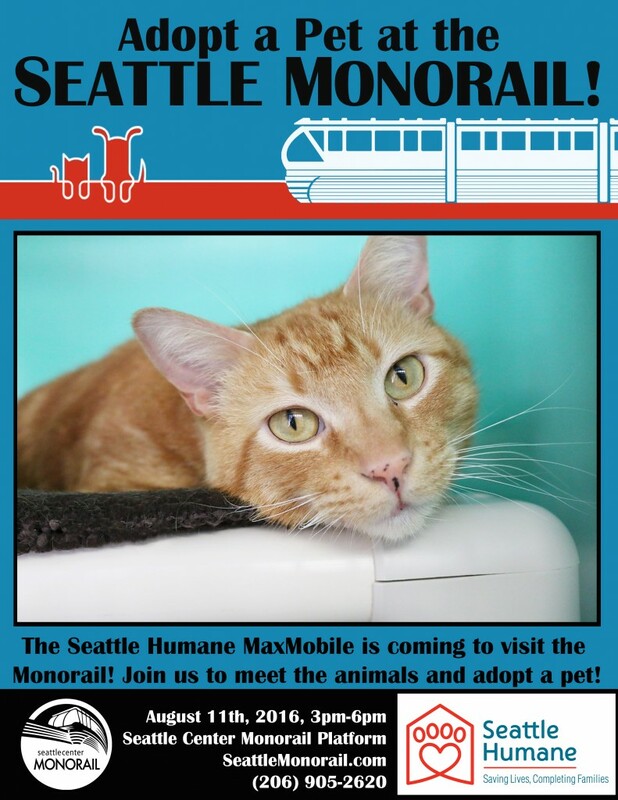 The Monorail is partnering with Seattle Humane, a local independent, non-profit animal shelter, to bring the MaxMobile to Seattle Center to promote adoption and collect donations. At the event, visitors can learn more about Seattle Humane, adopt a pet, or donate to the charity. Seattle Humane is truly an amazing organization, accepting every animal in need of help (regardless of age, physical condition, or breed) with no time-limits for adoption. The shelter saves more than 7,000 animals a year, with more than 80% of their budget funded by donations. You can also be sure donations are being used effectively by Seattle Humane–they were ranked among the top charities in the country by Charity Navigator. All-in-all, Seattle Humane is an amazing organization committed to helping animals in need and placing pets in loving homes. Donating to Seattle Humane or adopting a pet is a great way to improve the lives of animals. Come to the Seattle Center Monorail Platform on August 11th, 2016 from 3-6pm to check it out! Donations are always welcome for those currently unable to adopt a pet as well! We’ll see you there!